Paulo Rossi Oils are up to 900% more concentrated than other blends so only a few drops are needed to derive the best benefit and enjoyment of the pleasing aromas. Stimulation – Major essential oils are Lime, Lemon & Mandarin. This oil heightens awareness and receptiveness Stimulate the immune & digestive system. It is also antispasmodic, beneficial for menstrual cramps. Good for skin disorders. Is an antidepressant – giving a feeling of joy. Sleep – An excellent blend: Cedarwood, Lavender, & Ylang Ylang blended with others for this efficacious oil – soothing insomnia and restless sleep. A muscular relaxant reduces high blood pressure & acts as a sedative. Just 3 drops of this oil mixed with Carrier oil, used for massage, can have the same effect of as drinking 75 cups of herbal tea. Concentration – The efficacious blends in this oil are Peppermint, Jasmine & Lemon – all renown for improving memory and recall. It helps relieve headaches, muscular aches, pains, colic, travel sickness and flatulence. Stimulant to improve memory, alertness and Concentration. An antidote for shock & trauma. COLDS & FLU – An excellent blend to help prevent contracting Flu virus. 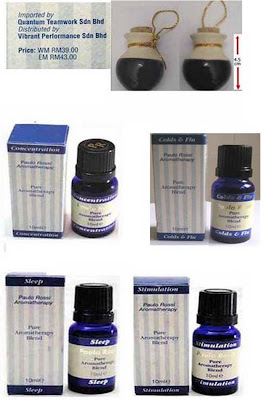 Paulo Rossi aromatherapy blends may be used in the bath, in a massage oil or in a diffuser. Fill the mini aromatic pottery with water up to half full. Pour just 5 - 7 drops of Paulo Rossi aromatherapy oil into the jar, the porous clay jars will continuously diffuse the oils into the air. Put in your car, room, toilet, etc. For Your Normal Diffuser - just put 4 - 5 drops - very economical. Normal Retail Price: RM90.00 (total items) W.M'sia.